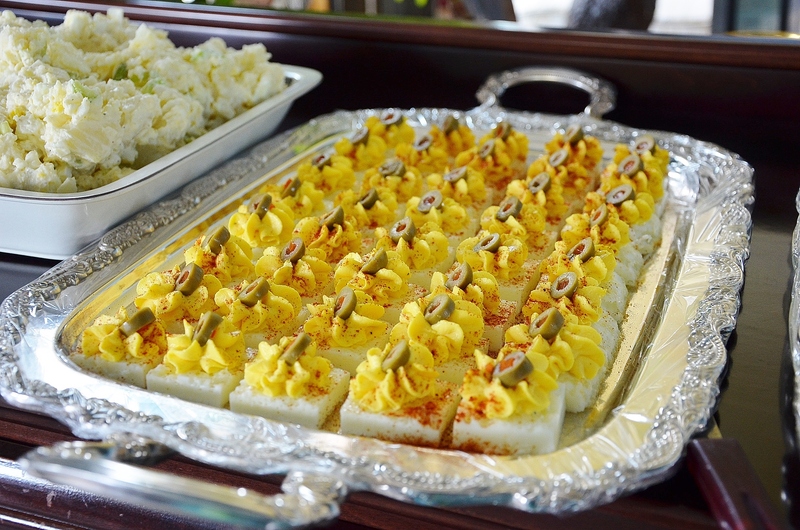 For a special occasion these square deviled eggs are worth the time! I’ve made these twice. The first time it was easy to flip the egg whites out of the pan. I think I used a 9X13 that time. The next time I was making a LOT, got busy with other food prep and they sat in the baking dishes for a good while. They were a bear to get out. Frankly, I only make these for very special occasions, and when I make them again, I am going to use parchment paper to lift them out and then a spatula to move them to the serving tray. Equipment needed: a pastry bag fitted with a small round pastry tip and an 8X8 baking dish or a 9X13 pan, if you want to make a double batch. If you use a 9X13 pan, the egg whites will be just a tad thicker which is okay. You do not want to go thinner or they are hard to handle and remove from the pan. Separate the egg whites and yolks into 2 bowls; set aside the yolks. Whisk the whites until just foamy, transfer them to the prepared baking dish, cover the dish with foil and bake until the whites have fully set, about 20 minutes. Let cool completely in the baking dish. While the whites are baking, beat the yolks until smooth. Lightly coat a medium nonstick skillet with cooking spray. Add the yolks, and scramble over medium low until fully cooked and slightly dry, 4 to 5 minutes. Transfer the yolks to a food processor. Add the mayonnaise, sour cream, vinegar, mustard, ¼ teaspoon salt and a few grinds of pepper, and pulse until smooth and creamy. Transfer the yolk mixture to a pastry bag fitted with a small round tip. Flip the egg whites out of the baking dish onto a cutting board. Cut into even 1-inch squares. Pipe swirly dollops of the egg yolk mixture onto each square. Sprinkle with paprika, chives, olives or whatever you want to use for as a garnish.